Want to see what they look like? The theme is aqua and yellow. I used Papertrey Ink Beautiful Butterflies stamps, some Papertrey Ink inks and some Ranger Distress inks, that's it! 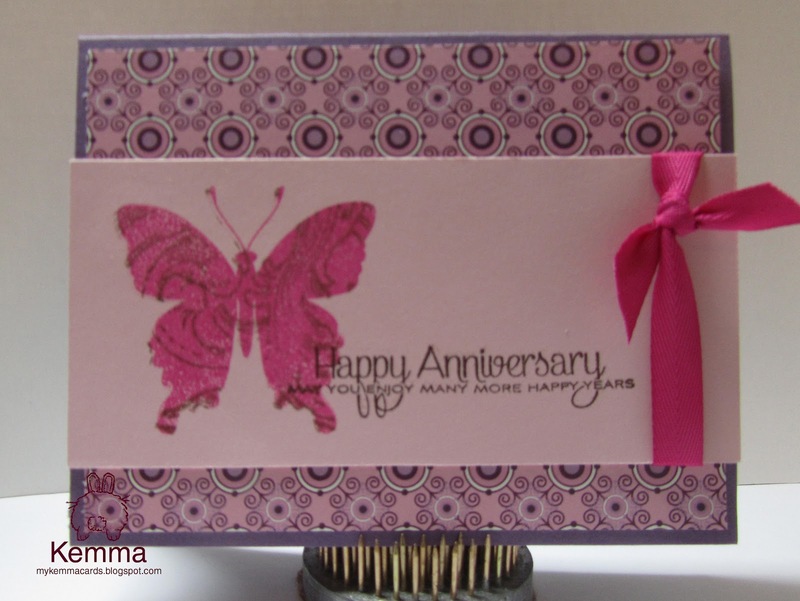 I am really starting to love the stamping! 2. 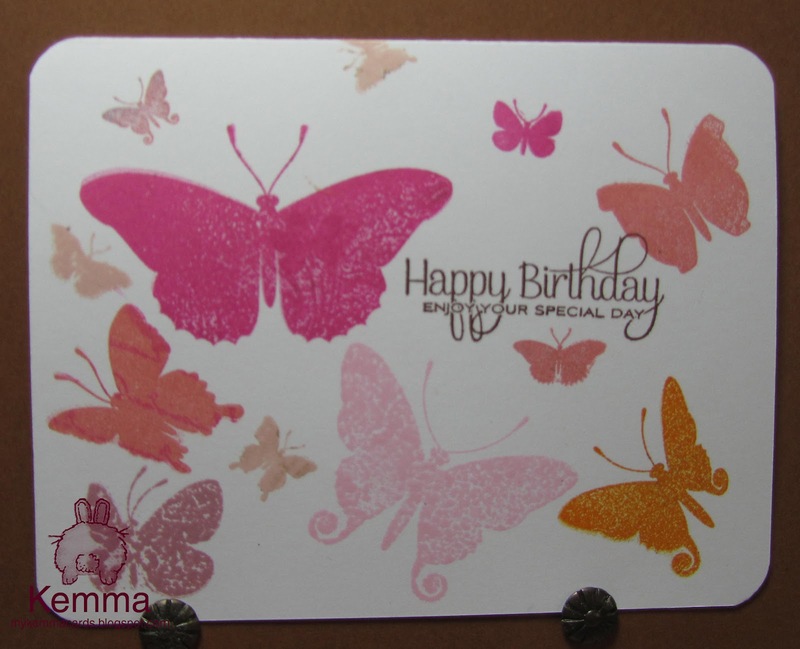 Use a white card base, however many shades of pink you want, and one shade of orange. 3. 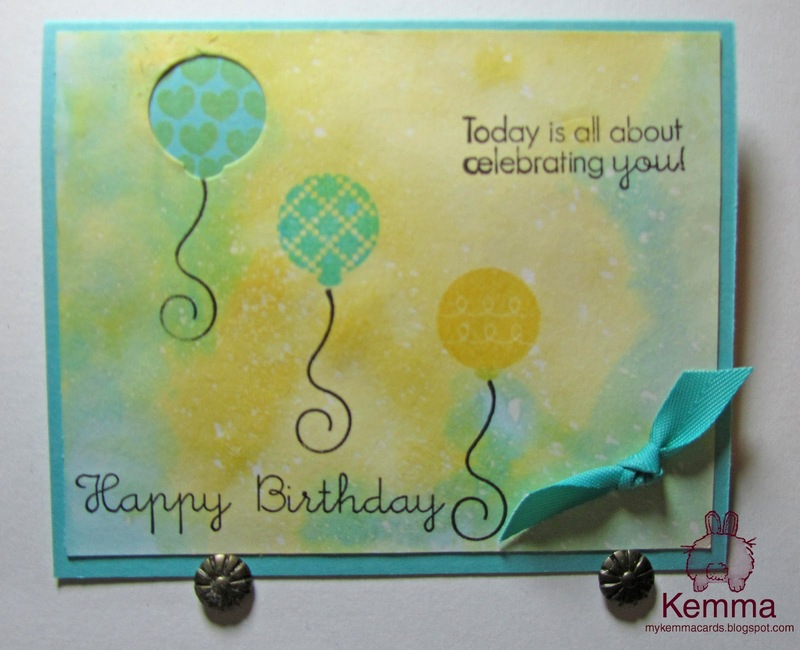 Post your card somewhere online and link back to it using the InLinkz button on the sidebar ofSimplicity. Lots of stuff on the craft desk today. 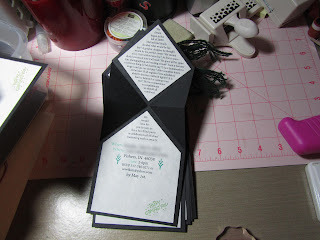 I need to get these graduation invitations finished so they can be mailed this weekend. Big progress, have 30 cut out and just finished up 30 tassels. Oh look, Jake wants to help! Now to get the inside piece made, the tassels attached and the envelopes addressed! Must get back at it! So who doesn't love a good latte from time to time--me!! Look what I came up with tonight, love it when I can combine two challenges! Want the details of the challenges? Weekly Challenge #54: Decorative Letter Challenge! 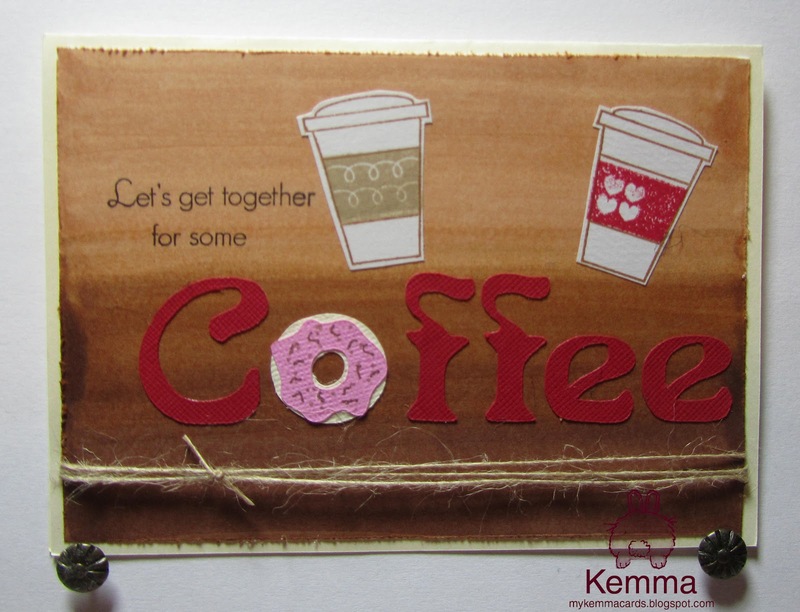 The Challenge: Create a scrapbook page, card, home decor item, or other project where you include a word of your choice. One or more of the letters in your chosen word must be replaced by a Cricut shape. For example, replace the letter “o” in the word LOVE with a heart. --Create a project utilizing your take on the challenge. 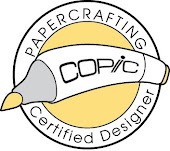 Your project must use at least one Papertrey product and some sort of graduated background. Today's Challenge over at Cooking with Cricut is St. Patrick's day or Rainbows. I wanted to create a little bit of a different spin on a Rainbow with my design. 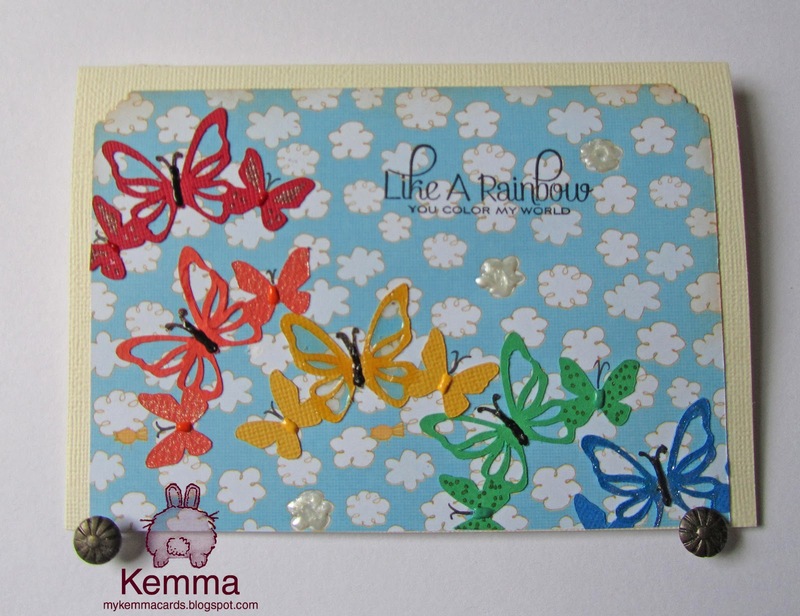 My rainbow is made out of butterflies! Cricut Cartridge used is the Paper Trimmings Cartridge. 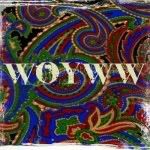 WOYWW 145 Come take a peek! It's that time of week again! 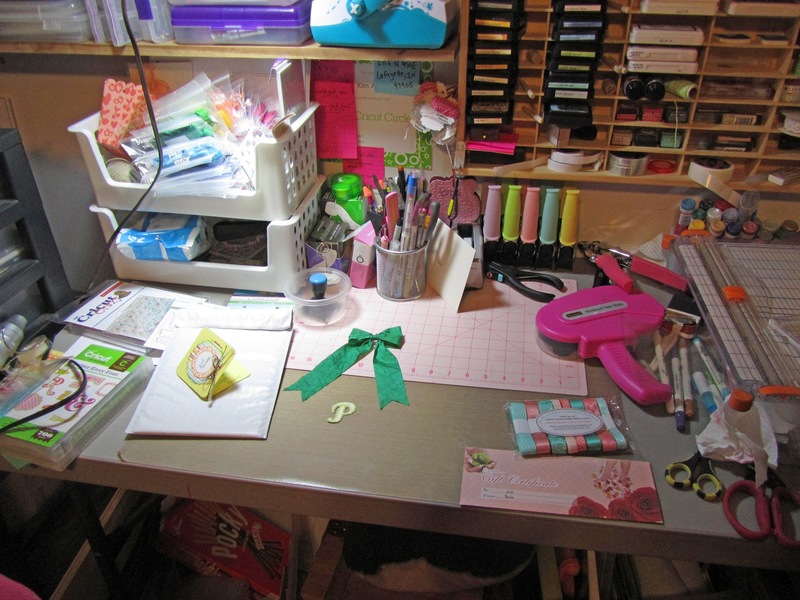 Time to gape at my wonderful workdesk and see if I am keeping busy or not! Do you see my new toy there? Yes, even though I have two Cricut machines, I thought I needed a Cuttlebug too! I did a little reorg with the pens, adding another larger pen cup. Made a few cards this week, see my prior blogs, and I have a new one being posted tomorrow too! There will be a lot of changes coming soon to my craft space as it gets all packed up so the floors can be installed in this room soon. They came out and did the official measuring today and I should be able to decide if its carpet or laminate once I can get an exact estimate. I am leaning towards laminate, and am doing two adjoining rooms. Want to see what the floor looks like now in here? 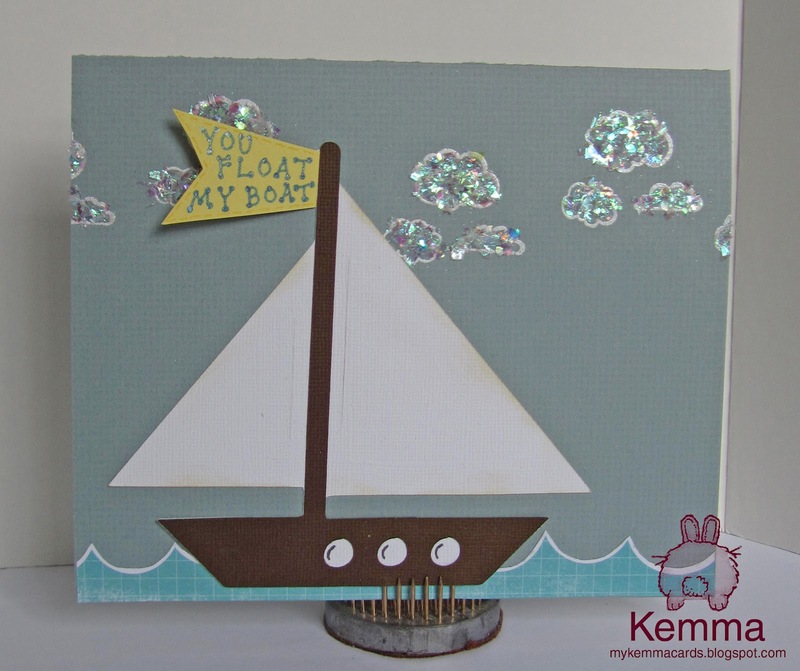 This is my entry for Papertrey Ink's Make it Monday challenge. It was a neat technique called colored kissing. 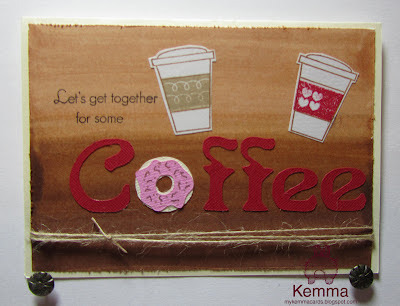 Cricut Circle Weekly Challenge #53: Wearing O’ the Green Challenge! Sorry for the terrible photos, but I was in a hurry to take them. This is a pin to wear for St. Pat's day that I made for a friend. I used Letter Envy cartridge for the letter and shadow, added some gems and glitter. No matter what I did I could not get a better photo for this, so sorry! Wow I haven't posted since last week's WOYWW! Shame on me! I will be posting more later today or tomorrow. Had a little bit of a dry spell, didn't feel like crafting. Been rather cranky all week for no good reason. Got my new monthly pack of ribbon in the mail today, love getting that! Still cranky. Oh and I found out apparently I was missing one of the corner chompers, the yellow handled one, so you can see that has been added to the collection. My birthday is this Saturday, so got my first gift laying there on the table too, a pedicure gift certificate woohoo!! Gotta love those! I look forward to doing that very soon. Let's see oh and the green ribbon there is for a pin I am making for a friend's daughter. Once the glue dries for the pin part, that letter P there will go on the other side right in the center of the bow. 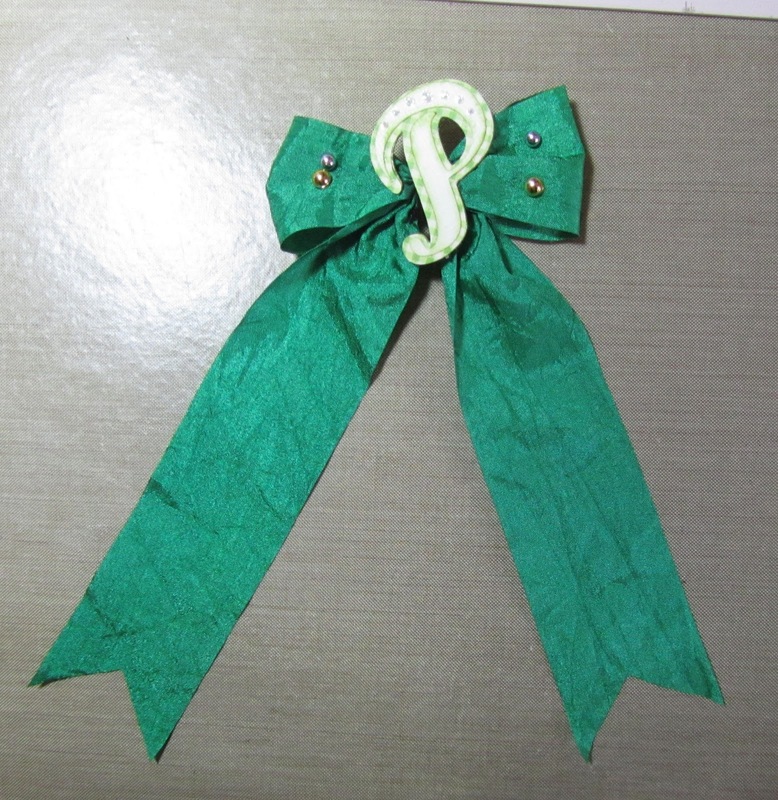 Her name is Patty, hence the P. Plus I made it green in case she wanted to wear it for St. Patty's day! hehehe ok, she might! The little note I am including and the mailer are sitting there with it, oh looks like I didn't put up the cartridge yet I used for it either. Have not made any progress on the graduation cards from last week. I do need to get going on that. I guess I am stalling some because, Michael, my graphics-design-graduating love-of-my-life-soul-mate, is doing the layout of the text I gave him to go inside. And, I am still waiting on him. I had finished making one of my bestest buddies their birthday card last week, her birthday is also this week, so I filled out the card this evening. 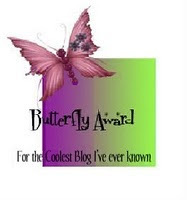 I am trying to figure out how to turn off the captcha thingie for comments. Let me know if its still on. Thanks!